It is an image that many recognise but most know nothing about. The plague mask—with its elongated beak and dark, soulless eyes—has been replicated in costume shops around the world [see left]. Indeed, so prevalent are these masks at parties and balls, one might be tempted to think it is a design entirely imagined by Italian mask-makers for the Venetian Carnival. But where did this mask originate and what purpose did it serve during plague outbreaks? From this description, it is tempting to conclude that de Lorme was trying to protect himself against germs by wearing something akin to a modern-day biohazard suit. However, a coherent germ theory did not emerge until the mid-19th century with the experiments of Joseph Lister, Robert Koch and Louis Pasteur. That said, de Lorme was trying to protect himself against something he believed was just as insidious and just as dangerous as we understand germs to be today: miasma, or poisonous vapours associated with decomposition and foul air. De Lorme imagined that the herbs stuffed in the end of the beak would purify the air and prevent the plague doctor from breathing in the miasma, while the leather overcoat, breeches, boots and gloves would ensure that the skin was not exposed at any time. The hat [see right] was that which was typically worn by physicians during the early modern period and thus served a purely symbolic purpose. The wooden cane, on the other hand, was likely used to keep patients at a distance, or else direct caregivers on how to move the bodies of infected victims during examinations. It was not used, as some suppose, to beat away the rats who are today widely believed to have carried fleas infected with yersinia pestis, the bacterium better known as plague. It is difficult to know how ubiquitous the plague mask was in the 17th and 18th centuries. Most physicians fled the city during outbreaks, leaving the dying to fend for themselves. Those who did remain behind rarely mention it in their writing, making the mask all the more elusive to historians. Today, the plague mask lives on in the imaginations of artists, writers and film-makers [click here for a stunning example]. Through them, it has been transformed into something altogether different, for the plague mask which was once used to ward off death, has now become the very symbol of it. 1. Quoted and translated in Michel Tibayrenc (ed. ), Encyclopedia of Infectious Diseases: Modern Methodologies (2007) p. 680. From M. Lucenet, ‘La peste, fleau majeur’ extraits de la Bibliotheque InterUniversitaire, Paris (1994). My obsession with the plague years began when I was 15 or so; I read Barbara Tuchman’s A Distant Mirror. I have since found the Great Mortality a useful text among others. I don’t get a chance to discuss it much in my own classes (which rarely touch upon so early a period), but of course the fear of plague inspires–and infects–so much of the 17th and 18th century’s literature, fiction and even treatments of latter-day disorders. Your post reminds me that, in many ways, we have never quite gotten beyond the plague years (at least in our imaginations)! I’ve been trying for two days to see that mask in the link at the end. The page just won’t load for me. I agree that the plague shaped our attitude about many things, even today. The difference is, we have science now to explain things. Doesn’t make them any less scary, but at least we know what their causes are now. Not sure. Maybe it’s because I’m in the US? The address just won’t resolve. I keep getting a ‘time out’ error. It’s all good. I still learn so much from you. Chlorine dioxide just cured 21 ebola victims in sierra leone.also calcium hypochlorite (pool shock) in capsules taken with 8+ oz of water = hypochlorous acid Cured several ebola patients in same test…i am sure it can cure the plague. The attribution of this invention to Charles Delorme (1584-1678) rests on a passage in a book published by his pupil, the eccentric Michel, abbé de Saint-Martin, Les Moyens faciles et éprouvés par M. Delorme pour vivre plus de cent ans (1682). 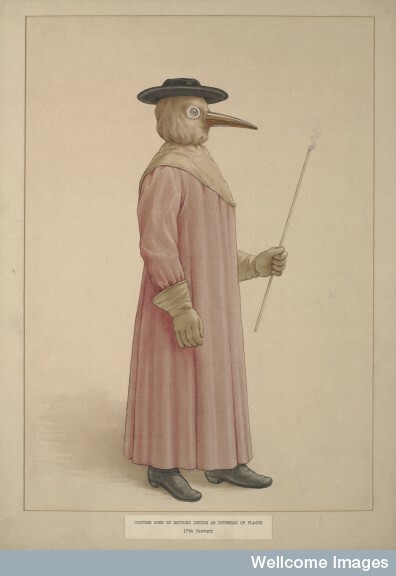 The costume was supposedly first used at Paris during the plague of 1619, but the original description differs significantly from the passage above, notably in the absence of the beak. I would very much like to know where the larger version of the remarks was first published. Il se fit faire, dit-il, un habit de maroquin, que le mauvais air pénètre très difficilement : il mit en sa bouche de l’ail et de la rue ; il se mit de l’encens dans le nez et dans les oreilles, couvrit ses yeux de bésicles, et en cet équipage assista les malades, et il en guérit presque autant qu’il donna de remèdes. Very interesting to say the least, the bubonic plague has always facinated me. half of Europe’s population died from The Black Death, it was one of the most devastating pandemics in human history. On the subject of the plague, there’s a great short story “The weighing of ayre” which raises the possibility of using biological weapons centuries before they were actually deployed on the battlefield. Can anyone tell me what the words on the mask are…or rather the translation? Does anyone know what the plague mask was made of? In some prints, it looks like it’s made of just leather with the beak stuffed with the herbs etc, while in others, it gives the impression there may have been something more solid?